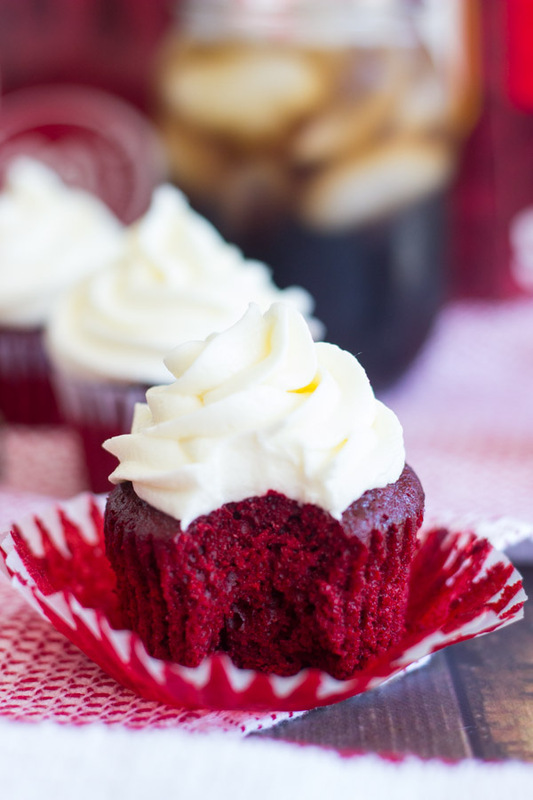 Dr Pepper Red Velvet Cupcakes with Cream Cheese Frosting! 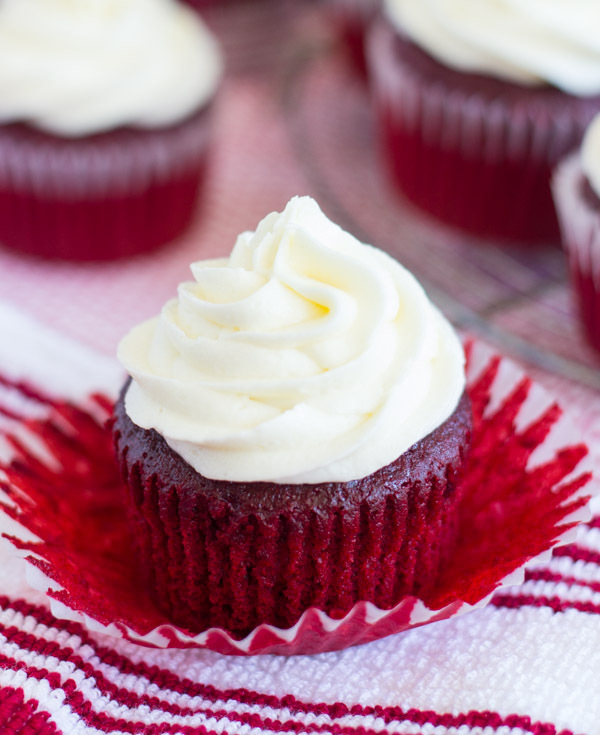 Tender, moist, and rich red velvet cupcakes, spiked with Dr. Pepper for ultra-unique flavor. 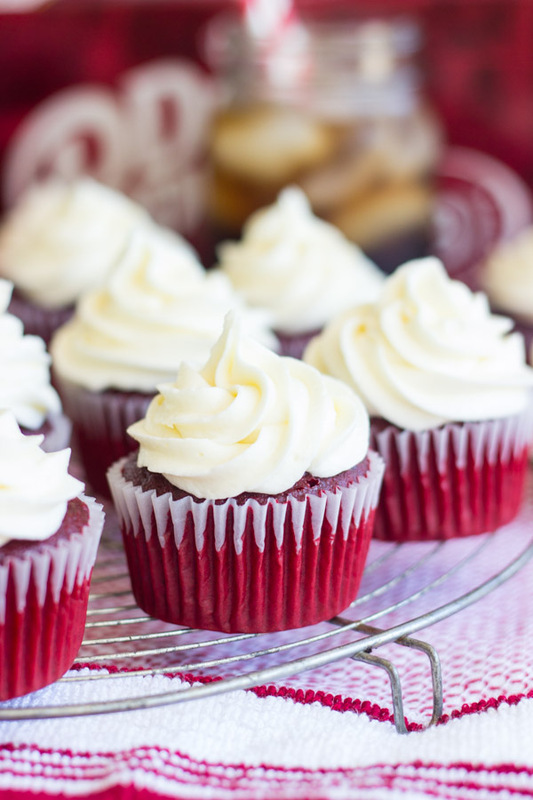 These Dr. Pepper Red Velvet Cupcakes are topped with creamy, fluffy, tangy cream cheese frosting, of course. 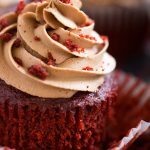 No red velvet cupcake is complete without it! 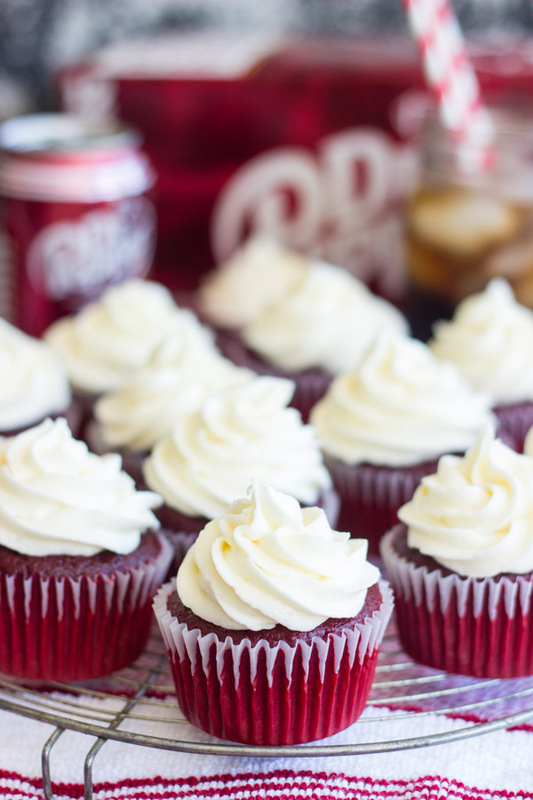 These Dr. Pepper Red Velvet Cupcakes are absolutely killer! I say this every year, so you guys probably already know what I’m going to say, but this is my favorite time of year. I love football season, and I wait all year for it. I’ve been a huge football fan for years, and I look forward to rooting on my college team. Football parties and get-togethers are such a big part of that. I revel in the camaraderie of rooting with fellow fans of my team, and I even enjoy talking to fans of other teams. College football wouldn’t be what it is without good rivalries. For the first day of college football season, we had pizza, actually. I also cracked open a few cans of Dr Pepper to go along with the pizza. I love that Dr Pepper has such an original flavor – there’s no other soda quite like it. It hits the spot for a refreshing drink when I’m watching college football. 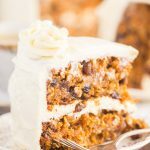 I wanted to round out the entire meal for football-watching, and I’m a baker and sweet-tooth at heart, of course, so we needed a dessert. 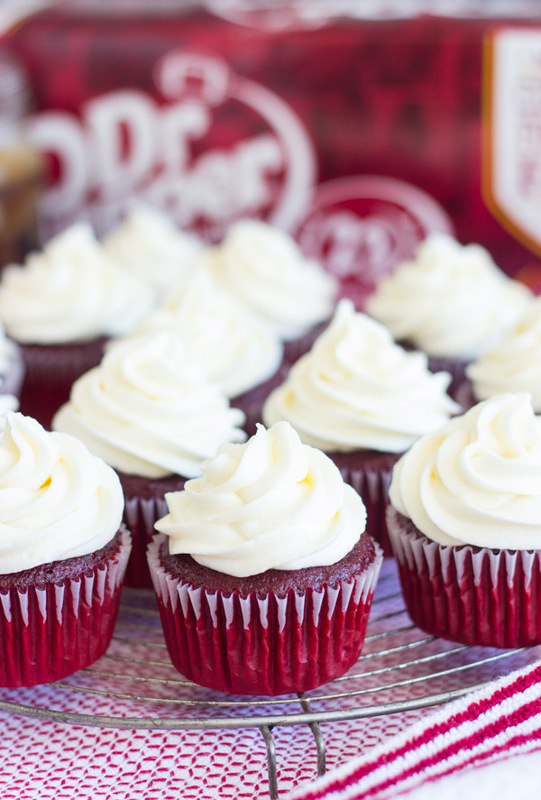 I used a can of Dr Pepper to spruce up a red velvet cake mix for these Dr. Pepper Red Velvet Cupcakes. I have several recipes for cola cake on the blog, and cola cake is a long-standing favorite recipe in my family. I usually make it from scratch, and it’s typically with chocolate and cola. Instead of making the traditional version, I decided to use red velvet cake mix and Dr Pepper to come up with these Dr. Pepper Red Velvet Cupcakes. 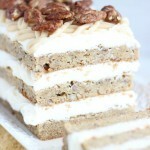 The flavors together were delicious, especially when topped with my favorite cream cheese frosting. 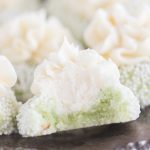 Food is such a big part of the football-watching experience for me, and I always look forward to planning football parties and get-togethers, and what food I’m going to make. 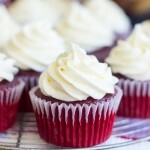 These Dr. Pepper Red Velvet Cupcakes were a great addition to our usual fare! Red velvet cake mix cupcakes, spiked with Dr Pepper for unique flavor, and topped with my favorite cream cheese buttercream frosting! In a large bowl, whisk together cake mix, eggs, vegetable oil, and soda, stirring until combined. Place paper liners in 24 regular-sized muffin cups. Fill muffin cups 1/2 full with cake batter. Add powdered sugar and vanilla, beating until light and fluffy. If needed, add 1-2 tablespoons cream to achieve desired consistency. It should be thick and fluffy, but pipable. That’s awesome. It’s a top favorite of mine too, for sure. 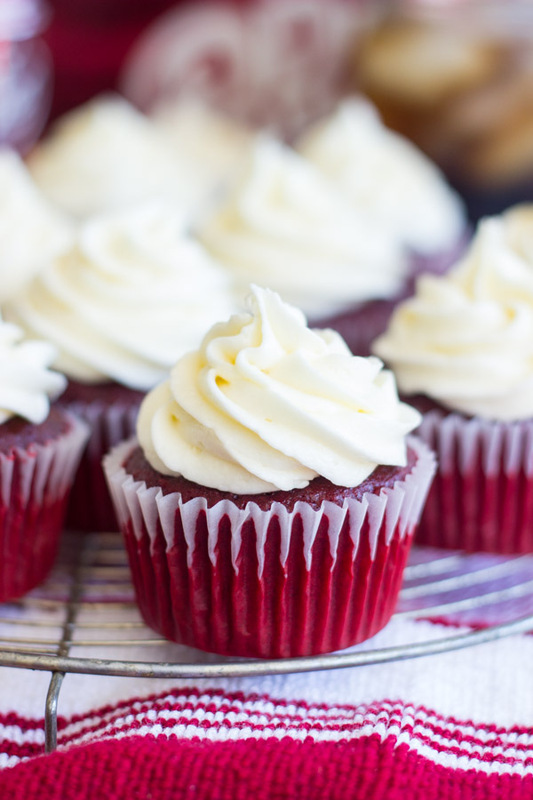 Nothing beats a perfect red velvet cupcake with cream cheese frosting. Thanks, Alix. Will this work as a cake… or just the cupcakes? 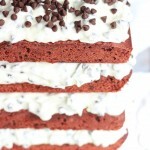 It will totally work as a sheet cake or layer cake too!! I would just make sure to adjust the baking times. It’s going to take a bit longer, of course!